These products are my go to items for almost every manicure I create. 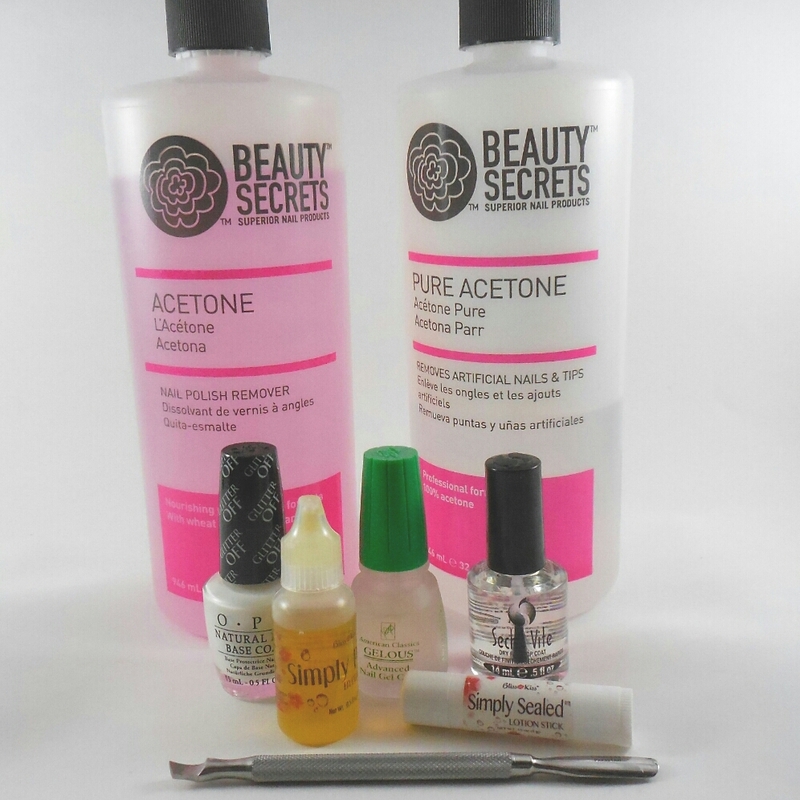 The acetones are by Beauty Secrets and are available at Sally’s Beauty Supply. The regular acetone is a pink formula that I use for removing polish. The pure acetone is clear and very potent! I use this only if I have very difficult glitter that doesn’t want to cooperate and for cleaning up around my cuticles after adding messy artwork aka gradients and water marbles. I then just place it in a small glass jar and using a clean up brush I get to work on all of the leftover polish. Next is O.P.I. Glitter Off. I use it a lot but I have to say that it is not my all time favorite. Maybe it is because I don’t keep polish on very long, but half of the time the polish doesn’t want to peel off like it is supposed to. It still sticks but with the help of the cuticle pusher shown and maybe some acetone it does come off somewhat better than if I used just a regular base coat. Also shown is American Classics Gelous. This is by far my all time favorite base coat! It makes regular polish last like gel polish when used along with the Seche Vite top coat (also shown.) I actually used my friend as a guinea pig…I wanted to test the Gelous base coat and since I change my nails like most people change their underwear there was no way to find out. I polished her nails with one coat of Gelous, two coats of polish and topped it all off with Seche Vite. Her manicure lasted 7 days with no chipping. I did, however, wrap the free edge of every nail with every coat applied and I know that also helps. Both the Gelous and Seche Vite are also available at Sally’s. Next in the lineup is my Simply Pure cuticle oil and Simply Sealed lotion stick. These are heavenly! I cannot say enough good things about them. I am applying the oil at least 5x a day and the lotion stick once or twice. The oil has helped me tremendously transition from weak nails when I removed my acrylics, to healthy natural nails. The lotion is amazing as well. When applied to the back of your hand it warms up with your body temperature and smoothed on like butter. I purchased these from Ana at the Nail Care HQ. Not shown in this picture are a million other things that I use all of the time. Makeup sponges, Q-tips, liquid latex, files, buffers, paper towels, lint free pads, Orangewood sticks, and the list goes on. All of these items will be talked about in more detail when I post nail art and how-to’s. If you are still reading, thank you! We both made it through my very first blog post. I hope I was understandable when I was talking about the products.